SOMETIMES I FEEL like I am missing out on a whole big wide world of art. Not because art is absent here in outstate Minnesota. It isn’t. Recent years have seen a renewed effort to bring the arts—visual and performing—to communities like mine outside the Twin Cities metro area. Faribault has the Paradise Center for the Arts. Neighboring Owatonna, Northfield and Waseca also have art centers. Even the community of Zumbrota, population around 3,400, has the thriving Crossings at Carnegie. So there are plenty of opportunities to engage in the arts at a local and regional level without venturing into Minneapolis or St. Paul, which I really prefer to avoid given my aversion for traffic congestion and big cities in general. Despite an abundance of wonderful local art, I was still missing that segment of art created by renowned artists or by artists outside of Minnesota. That is until I recently realized that I can see that type of art, too, right in my backyard. 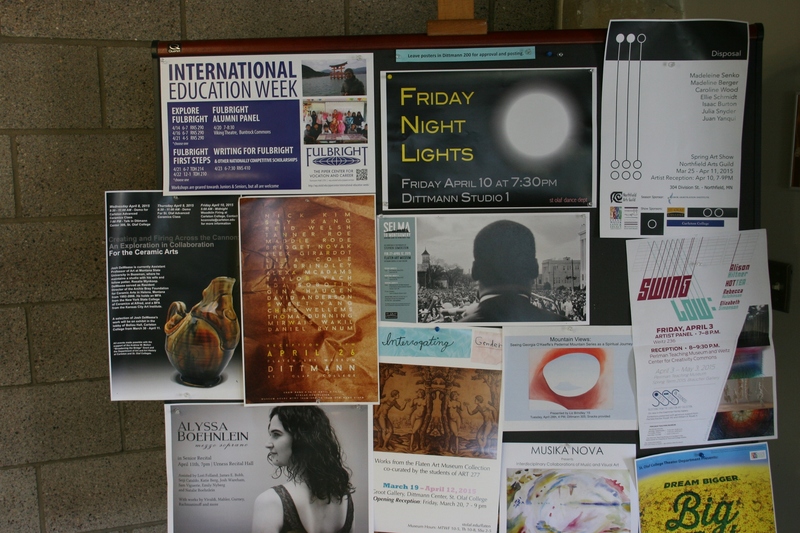 Promotional posters posted in the Dittman Art Center at St. Olaf College show the wide variety of artistic offerings. 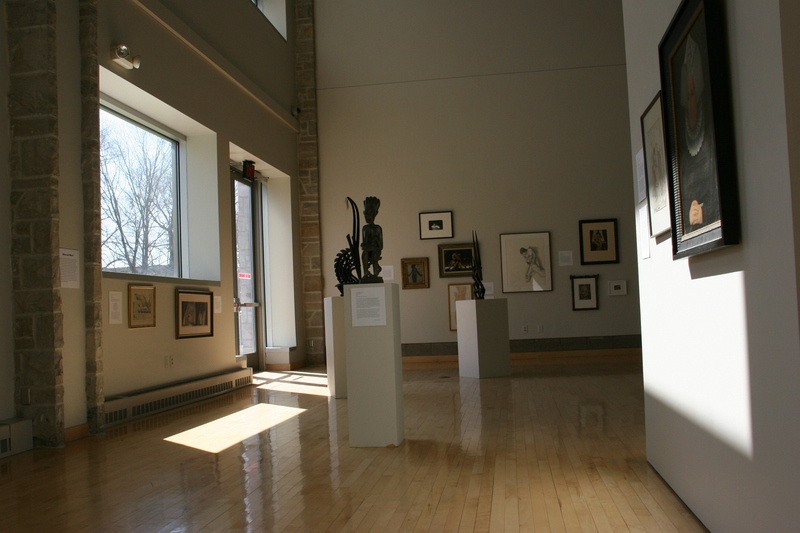 Two colleges in Northfield, a 22-minute drive from my Faribault home, both sometimes showcase notable art from their collections in exhibits that are open to the public. They also bring in outside artists and traveling exhibits. 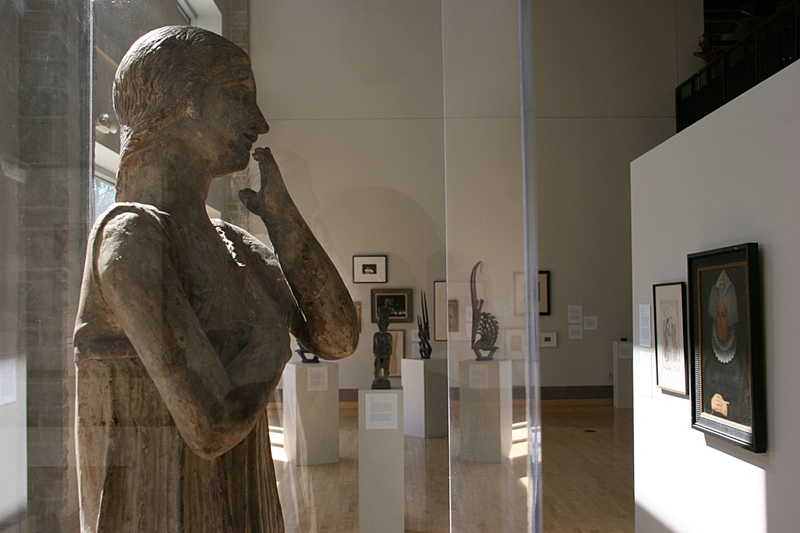 Entrance to Carleton’s Perlman Teaching Museum and St. Olaf’s Flaten Art Museum is free. No cost and no traffic are a winning combination for me. 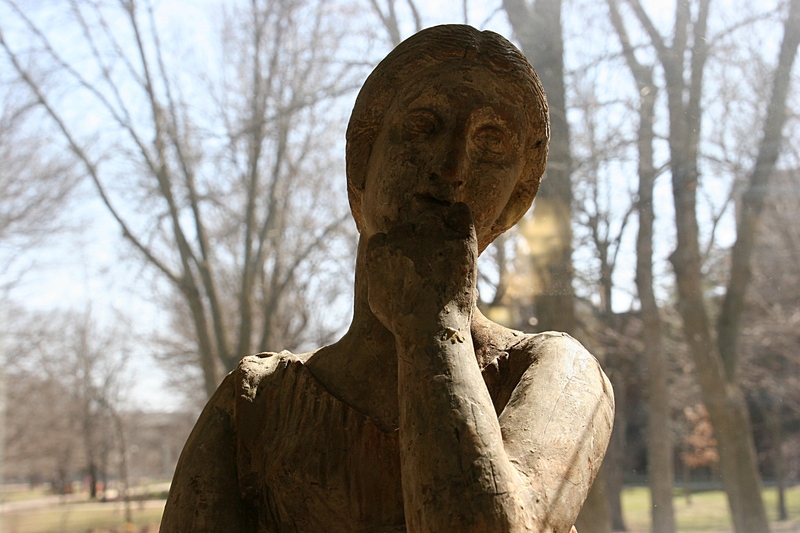 Items from St. Olaf’s art collection were displayed in the recent “Interrogating Gender” exhibit. Together, these two prestigious private colleges hold more than 6,500 paintings, fine art prints, photographs, sculptures and more in their collections. 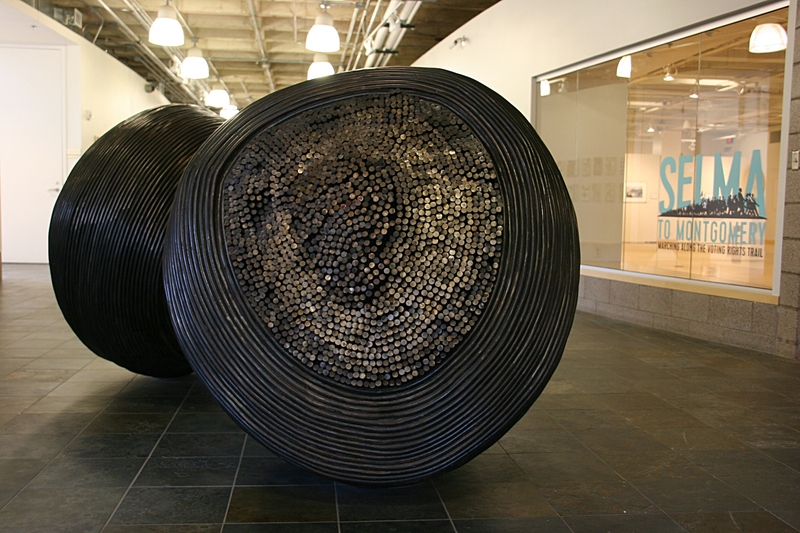 Entering the Flaten Art Museum Atrium, I encountered this mega sculpture just outside the “Selma” exhibit. I discovered Carleton’s gallery space about 18 months ago and St. Olaf’s just recently, when I arrived at the college atop the hill to view Selma to Montgomery: Marching Along the Voting Rights Trail, an exhibition of Stephen Somerstein’s photos. Walking across the hall from one museum space to another, I found Michon Weeks’ “Wheel Within a Wheel (#1-44) paintings hung along the atrium wall. 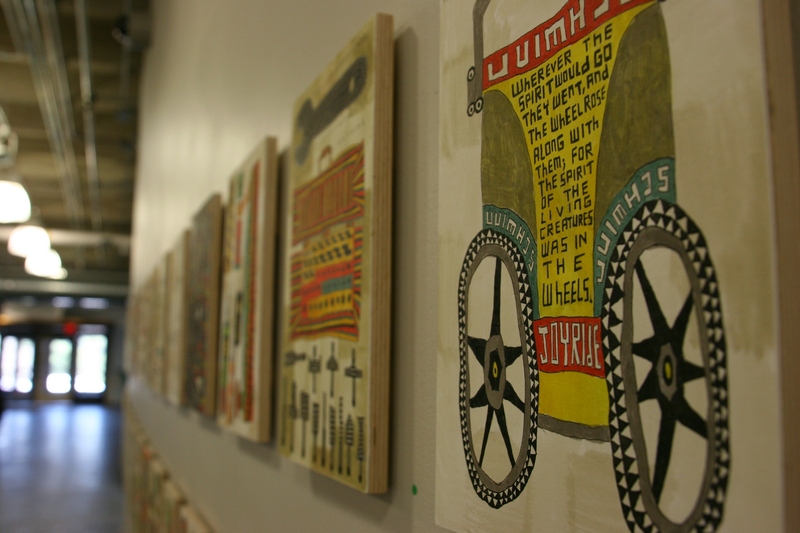 The acrylic on wood panel paintings are a visual inventory of items in her Northfield garage. After studying Somerstein’s remarkable images, I strode across the hall to see the Interrogating Gender exhibit, since closed. 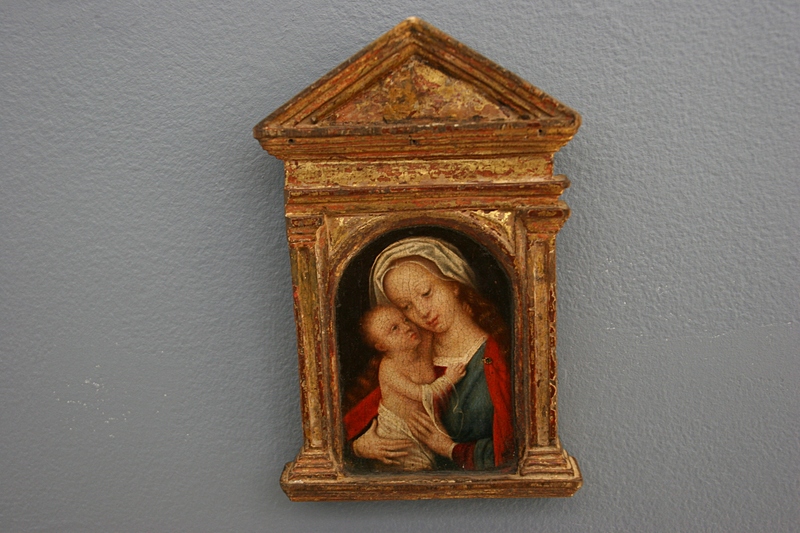 The 16th Century “Madonna and Child” by Adriaen Isenbrandt of Belgium. The angle at which I photographed “Archaic Greek Statue of a Woman” makes it appear as if the Italian terra cotta sculpture is studying the art on display. There I marveled in getting close up to photographs taken by Andy Warhol. Yes, the Andy Warhol. I stood in reverent awe before a 16th Century oil painting on panel of Madonna and Child by Adriaen Isenbrandt. I enjoyed art from Africa and Italy and the Cows in Pasture pencil on paper by Rosa Bonheur. I could have reached out and touched the art, except I didn’t. It was that comfortably accessible and intimate. I didn’t have that feeling I often get in galleries of “be careful and don’t touch,” although I was aware of cameras on the premise. My husband peruses the art. I only wish I’d realized years ago that I could simply walk onto these college campuses and view art by well-known and other artists and students, too. I got down low to photograph the Greek woman sculpture encased in glass. Now that I know, I’ll be back. FYI: All of the exhibits mentioned in this post are no longer showing. Both colleges will be featuring a Senior Art Show in their exhibit spaces. Please check back for a story and photos of the Selma to Montgomery exhibit. Wonderful. I know I don’t take advantage of the opportunities near me. Seeing this post reminds me that I should. That’s what I was hoping to accomplish with this post–remind folks of what’s available right out their back doors. 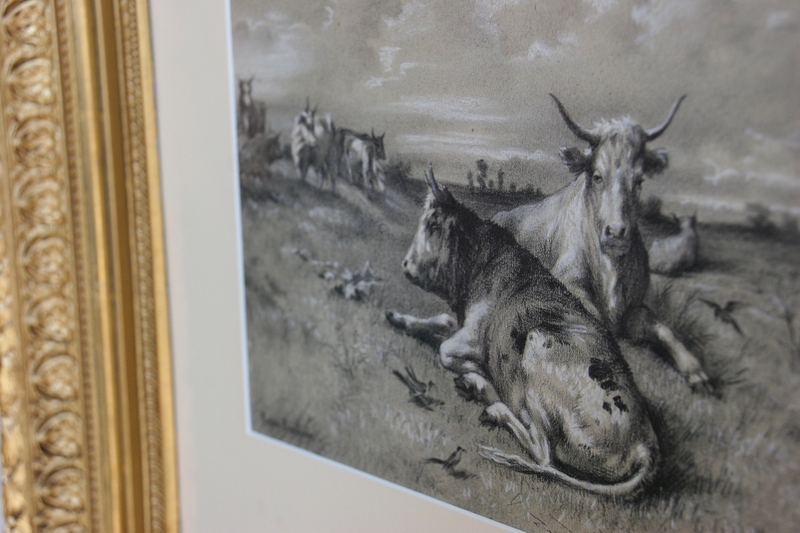 Thank-you for highlighting Rosa Bonheur’s sketch–I’m a big fan of her work. I will keep these galleries in mind the next time I visit Northfield. 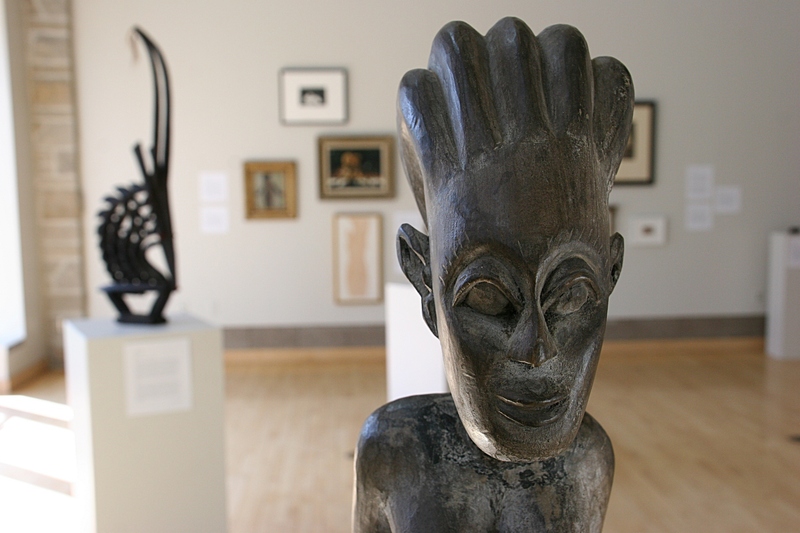 Thanks for making all of us aware of these two galleries at two of our fine Minnesota teaching institutions. You are most welcome, Lori. Thank you for stopping by with a comment and for reading Minnesota Prairie Roots. Audrey, your photographs are exceptional. Particularly like the Greek statue of a woman. I was interested during our long layover in the MInneapolis airport to view a wonderful gallery space of art created by various Delta employees. It’s everywhere if we just pay attention. You’re right. Art is everywhere if we only pay attention. Delta employees creating art for a gallery at the airport is a wonderful idea. Glad you enjoyed the images. What a great place to spend some time enjoying the talents of many. It amazes me where art can be found. Sometimes it is in conventional places like museums and sometimes in wacky places like the Rancho Deluxe Z Garden in Mason City. And I do love the Rancho Deluxe Z. As much as I enjoyed your introduction to these museum collections I am surprised you were allowed to photograph the paintings. Guess no flash cell phone photos are permitted these days? 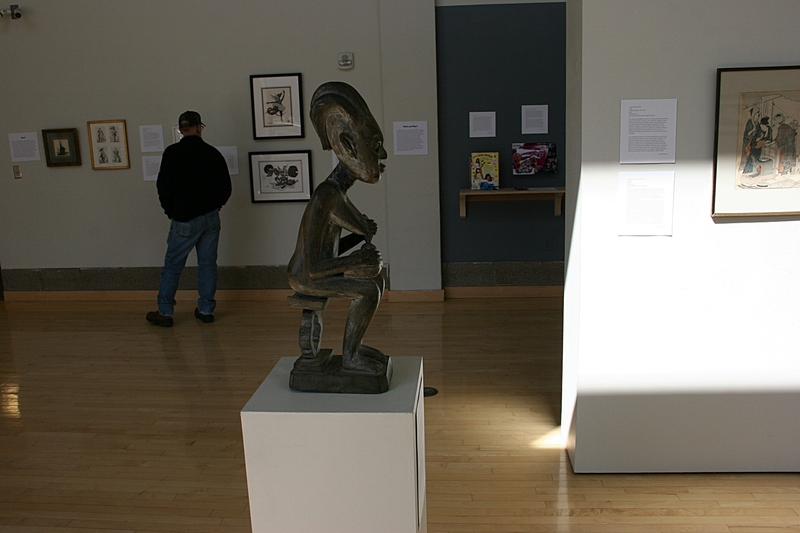 I inquired as to whether I could photograph exhibit pieces and was given the OK. I seldom use flash and certainly would not do so in a museum or art gallery. These were not taken with a cell phone but with a DSLR. What an interesting tour. We have a Science and Arts University nearby and I bet they also have a gallery that the public may tour! I’ll look into it… though it is usually in the winter months I have time to take in such activities! Audrey, do you carry your DSLR with you everywhere? I’m terrible about doing that. This is one of the things I love about your candid photography – whoever and wherever! It’s always interesting. Yes, I do make a habit of taking my camera with me most places. Well, not to the grocery store or the library or the…, although sometimes even then I’ve regretted leaving it at home. One Sunday morning a few years back I had to run back home for my camera after a special flag was displayed at church for the Fourth of July. I have a simple cell phone (not a smart phone) so cannot really use that to take photos. I appreciate that you find my photos interesting. There’s so much right around us that is worthy of photographing, if only we take the time to notice. I love college art museums! My mom used to work at the one at the university of Oregon. What a great discovery! That would have been a great job. Both of your parents are creative types then? Mom’s artisticness was in her sewing and singing and a little writing. Dad’s is behind the camera. Well, you definitely inherited those artsy genes. Just went to see a great art movie, “Woman in Gold” highly recommend it. Playing now at the Owatonna theater. Thanks for the recommendation. The last movie I saw in a theatre was “The Help.” So how many years would that be since I’ve been in a theatre then? Too many.